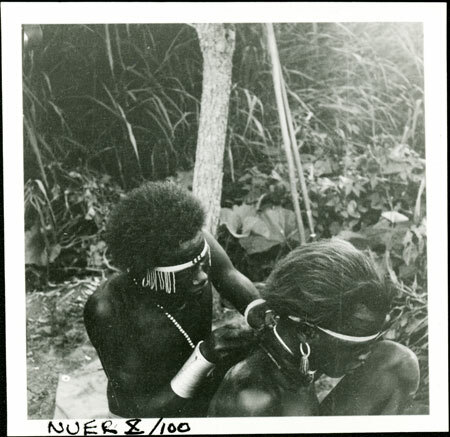 A youth wearing head and arm ornaments (thiau arm rings) tying a giraffe-hair necklace at the back of a friend's neck. The photograph was taken during July 1935 whilst Evans-Pritchard spent 4 weeks at the mouth of the Nyanding River among the Jikany, especially at Mancom village, the home of his servant Tiop-Lier. Note on print reverse ms pencil - "41 5" & print front border ms ink - "NUER X/100"
Morton, Chris. "Nuer youth tying necklace" Southern Sudan Project (in development). 03 Jan. 2006. Pitt Rivers Museum. <http://southernsudan.prm.ox.ac.uk/details/1998.355.498.2/>.